In 1869 the American George Barnard Grant (see biography of George Barnard Grant) enrolled the Lawrence Scientific School at Harvard, where he obtained his bachelor degree in 1873. Grant's first attempts to construct mechanical calculators were made while at the Lawrence Scientific School. According to his own testimony from 1871, his interest in the subject was aroused while he was computing a table for excavations and embankments, but he became discouraged with his initial efforts when he realized the subject was more difficult than he had anticipated. In 1870, however, he heard for the Babbage difference engine and proceeded to design one himself. Upon meeting with scepticism concerning the workability of his design, he again laid it aside. He was aroused to resume work on the project when the Professor Wolcott Gibbs inquired about his progress and encouraged him to pursue it further. Grant was in the right place: His major supporter, Wolcott Gibbs (1822-1908), since 1863 Rumford Professor of Chemistry at Harvard, was a member of that circle of scientists whose older leaders had supported Gould and his endeavours at Albany. Henry Lawrence Eustis (1819-1885), Professor of engineering, who became Dean of the Lawrence School in 1871, approved and helped the project. Another supporter was Joseph Winlock, director of the Harvard College Observatory, who when head of the Nautical Almanac had approved the work done on the Scheutz machine for that office. John M. Batchelder, who had operated the Scheutz machine at Albany as one of Gould's Coast Survey assistants, was in Cambridge, ready to advise Grant. Grant described the design represented in this model in the August 1871 issue of the magazine American Journal of Science. The publication, entitled "On a New Difference Engine", included references to several accounts of the Babbage and Scheutz difference engines, such as Lardner's detailed article from 1834 in Edinburgh Review, the 1854 British patent specifications of the Scheutz machine, and some of Babbage's own writings dealing with both machines. The version of the machine described in this 1871 article had numerous features in common with the Scheutz machine. Thus, it too was designed to print by stamping the result on a sheet suitable for stereotyping. Grant did not describe the printing mechanism, beyond observing that it contains nothing new of importance. Again there was a set of number wheels, and as in Wiberg's machine, their arrangement differed from that in the Scheutz machine by being purely linear. For a maximum capacity of n digits per number, there were n sets of these wheels, each using m wheels if the m-st difference was constant. All these wheels were arranged along a common axis. Again, odd orders of differences were added simultaneously in one operation, even ones in the next. Following this publication, Grant continued to occupy himself with the problem of mechanical calculation. Aside from reading widely in the existing literature, particularly the patent literature. Upon his graduation, his scientific benefactors supported the further development of the difference engine. In 1874 the Boston Thursday Club raised a subscription for the construction of a large-scale model, which was supplemented by a substantial support from Fairman Rogers of Philadelphia. 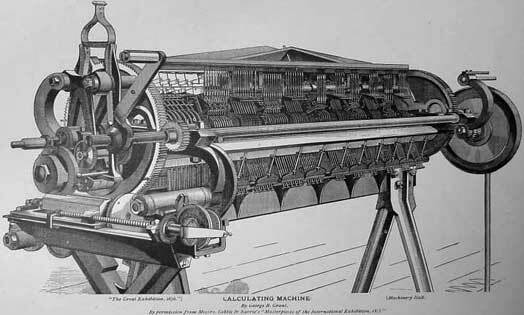 Rogers not only supported construction of the machine, but saw to it that Grant exhibited the machine at the 1876 Centennial International Exhibition at Philadelphia (see the lower figure), along with a small general-purpose calculator. The difference machine of Grant was approximately 2.5 meters long and 1.5 meters high, weight about 900 kg. It consists of up to 15000 pieces and is worth about 10000 $. It could be manually operated or connected to a power source. It was said to calculate 10 to 12 terms per minute when hand-cranked and to compute more than double that amount when power-driven; small sections of it had been tested at even higher speeds. The inventor emphasized the flexibility of the machine, which allowed any number of wheels of the k-th order of differences to be added to any wheel of the k-f 1-st order. An important distinction between this difference machine and the model described in 1871 lay in the arrangement of the number wheels. It was again linear. But in the 1871 model the wheels had been grouped by place figures, all the lowest decimal values being grouped together, then the next highest decimal value, etc. Within each such group appeared first the appropriate digit of the tabular value, then the corresponding one of the first order of differences, then that of the second order, and so on. Now the numbers were regrouped: all digits of the tabular value came first, then those of the first difference, then the second, etc. As a result, the carry mechanism, which was closely related to one covered by Grant's general purpose calculator patents, was simplified. The printing apparatus connected ten of the tabular function wheels with corresponding die-plates holding wax moulds for subsequent electrotyping. 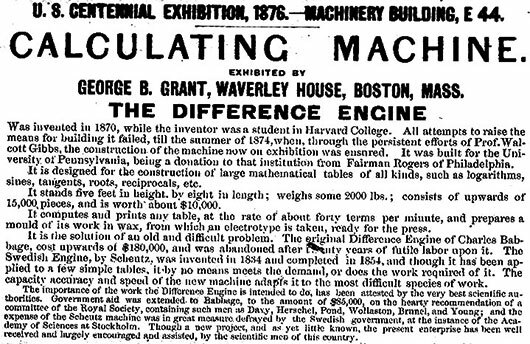 Despite some publicity and favourable notices at the time of the exhibition (the insurance company Provident Mutual Life Insurance Co. even ordered a machine made to Grant's design for purpose of calculating life insurance tables), the difference machine soon faded into relative obscurity. Grant continued working on mechanical calculators. In the decades that followed, he invented a second small all-purpose calculator (see the calculating machines of George Grant). His small calculators (Grant is a holder of four USA patents for his calculators—129335, 138245, 368528 and 605288), won some awards and were sold in small numbers. 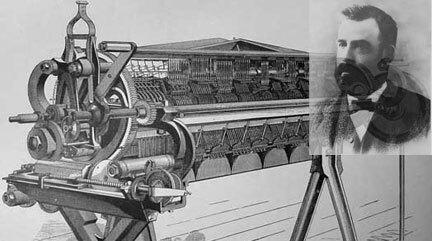 Grant became best known, however, not for his remarkable mechanical calculators, but for establishing a business that was a derivative of his experimentation with calculators. Just as Babbage's needs had led to advances in precision tool and parts manufacture in England, and Donkin's requirements for the second Scheutz machine caused him to develop new production techniques, so Grant discovered that, to obtain gears of the accuracy required for his calculators, he had to cut his own gears. Having hand-cut those on his early models, he established a gear-cutting machine shop in Charlestown, Massachusetts, soon after his graduation in 1873. As this business expanded, he moved it to Boston and named it the Grant Gear Works. From this extremely successful establishment sprang the Philadelphia Gear Works and the Cleveland Gear Works. Grant even wrote several very successful books on the subject, for example A treatise on gear wheels; A handbook on the teeth of gears, their curves, properties and practical construction, etc. George Grant is considered one of the founders of gear-cutting industry in USA. 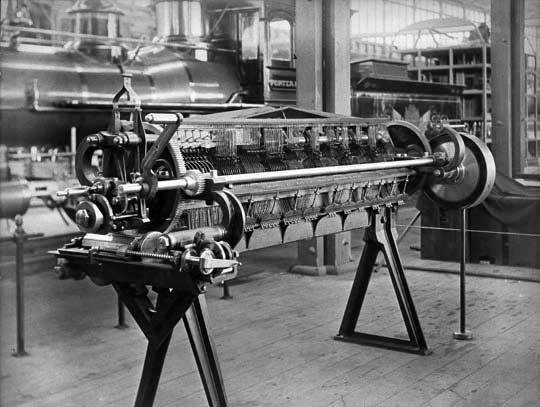 Whereas the Grant Gear Works continued to flourish after Grant's death in 1917, his difference engine, sent back to Philadelphia in the 1890s, had assumed the status of an antiquated curiosity.